I published this story in Middletown Life Magazine, Winter 2008, under my byline, Carol Child. My photo of Noxontown Pond, appeared on the magazine cover. On October 13, 2007, the Appoquinimink River Association held their first yearly Outdoor Exploration Social Event for members and those interested in joining the organization. Dan O’Connell, St. Andrew’s School biology teacher and president of the association conducted an ecology tour of Noxontown Pond on the St. Andrew’s biology boat. ARA board members with Sara Wozniak, executive director, put together the event and on this crisp October day served apple cider and homemade apple crumb cake, brownies, cookies and assorted other goodies in a pavilion overlooking the pond. 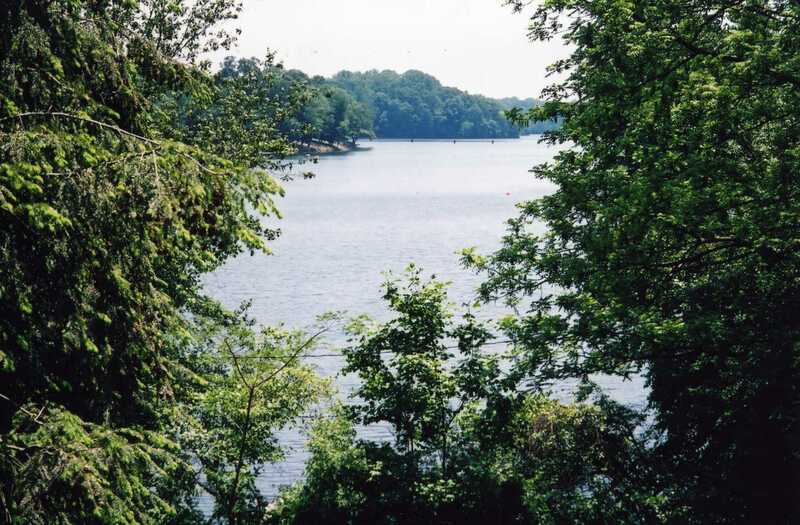 The pond, owned by St. Andrew’s School, is part of the Appoquinimink watershed and connects to both the Appoquinimink River on the north and Wiggins Mill Pond on the south, at Townsend. Dave Raughley, Townsend mayor and board member, steered our boat, conversing about Wiggins Mill Pond and Townsend’s environmental preservation activities. O’Connell identified the plants and animals living around the pond and discussed issues affecting the water quality. Blue skies smiled on us that Saturday afternoon as we circuited the pristine pond – no fishy smell – the air rising from it, just – well, clear; and listened to harmonies of the wind playing among the leaves, birds calling and responding overhead, and other creatures’ syncopated splashing here and there across the water: an idyllic intermezzo. We pulled sweet, juicy persimmons from a tree at waters edge and ate them, saw the fish ladder at the Appoquinimink River spillway – “We’re looking especially for shad and herring,” said O’Connell – and the green box where the biologists check the water quality. We noted that the river was at high tide, only two to three feet below the lip of the dam, and saw geese, a tern acrobatically swoop down and grab a little fish out of the water, a cormorant lifting off the water (“It’s as if they’re saying ‘I think I can fly,’’’ O’Connell said, as the dark, snake-necked bird flew horizontally, flapping, flapping its wings a foot or so above the water a good distance before lifting higher), several Red-tailed hawks circling above the trees, the sun illuminating their red tail feathers; and, finally, an osprey aimed straight towards our boat, flew overhead, circled and returned, the masked Lone Ranger. Although we didn’t see any, O’Connell told us a number of bald eagles nest in the area. The geese, O’Connell said, in the winter when the pond freezes, huddle very close together in the small amount of open water, where they can be safe from foxes and other predators. Up the banks and hills, in the woods above the pond, grow sugar maples, hickory, poplar, willow, chestnut oak, white oak, sweet gum, black gum and more, their leaves tinged with autumn this day. Even a few cattails grow near the pond; though native to our area, rare nowadays, choked out by non-native phragmites. The view of the St. Andrew’s School campus from the middle of Noxontown Pond is stunning, rising from the T-Dock and the no-mow areas along the banks, up the broad lawn to Founders Hall. The tower clock chimed. Our tour drew to an end. It seems there is a divine spirit living in Noxontown pond; and it serves to show us what our waterways and natural surroundings can be like if we just pay attention and appreciate what we have and take care to watch over our environment.